I have been waiting for AGES for this book to come out. There are doodles in the margins of my notebooks in sixth grade three years ago that say "Tut" on them, and mentions of shabtis in my notes. This book has been my favorite since I read it as a beta reader, and I even had to dig it out and reread it once. Tut is a character you'll want to meet in real life. Gil is the older guardian/mentor/brother/best friend you'll wish you had and will pretend you do. There are mad Egyptian generals, evil gods, scarab hearts and romance. It's deliciously amazing, and just about everyone in the world should read it. I really enjoyed this. A mix of Lightening Thief and Dan Brown for Middle grade readers the book had fun Egyptian mythology and fast paced adventure. Tut as you can guess is King Tutankhamen who is immortal but that means remaining 14 for the several thousand years. He hasn't learned much during that time and is still irritatingly foolish and obsessed with revenge. Luckily he learns a few things along the way with the help of a few mortal friends. I wasn't happy with the ending. It is clear there will be another book but I wish the author had hinted at what the minor characters in the book where going to be up to next. This is a wonderful book for upper elementary school, lower middle school readers. I love all things Egyptian, so I was excited to read it. It's got a lot of action and the main character is easy for young readers to connect with. I always enjoy when authors take creative license with ancient mythological characters and "modernize" them and I was not disappointed by this author's spin on things. This is a super clean book I could recommend to all my students (boys and girls) - a good recommendation for my Percy Jackson and Ranger's Apprentice groupies. Put this in the hands of your Percy Jackson fans. It is very similar in style and pacing. It has a hint of potential sequels but doesn't end in a cliffhanger. Percy Jackson, you have been warned. A new competitor has just entered the teen lit arena and he is sure to win over the hearts of teens and adults alike. Tut is sure to be a hit. Tut: The Story of My Immortal Life follows the journey of King Tut. Readers are first introduced to him in Ancient Egypt. Tut's life is in jeopardy. He is running from his uncle, who is responsible for the murder of Tut's family and is now out to get Tut. In his run in with his uncle, Tut is stabbed and about to die. In a last ditch attempt to live, he casts a spell that leads him to immortality. Unfortunately, it came with a price. Tut is doomed to spend the rest of his life as a 14 year old who must keep attending eighth grade over and over and over again. The novel continues with Tut in present-day Washington D.C. where Tut is attending eighth grade all over again and living with his brother-like guardian Gil and Horus. Tut discovers that his uncle may not be dead (as he has found immortality too) and he is ready to get his revenge. This sparks a search for a knife that will help Tut kill his uncle. Tut: The Story of My Immortal Life is everything that makes a great novel. It is fast paced, action packed, and is rather unique in its concept. Sure, Percy Jackson brought the well-known Gods to life, but this brings the often overlooked Egyptian gods to life. Hoover does an amazing job of not info dumping, but incorporating the god's backstory into the novel. It might not be the most in-depth look at the Egyptian gods, but it is enough to spark people's interest which I hope will encourage them to read on their own. One of the things I really liked was the way Hoover incorporated a parental figure into the story. When I read the blurb for this novel, I couldn't figure out how a 14 year old could just wander through life with no one questioning it. It appears it can be done when an older individual takes that 14 year old under their wing and acts like a parental figure. Gil, the parental/brother-like figure, in the story wasn't just placed there as a wall decoration. He was developed, had emotions, and really played a role in the novel. Many times YA/children's novels tend to have adult/parental figures take a back seat, but not in this one. Gil isn't the only character that is extremely developed. Hoover does an amazing job of quickly developing characters and making them relatable for the readers. The mortal characters were average, every day children that almost any reader could relate to instantly. Tut was likeable and funny. He was mature at times due to being alive so long, but there were times when he acted just like he was supposed to – a 14 year old boy. A favorite part of mine was the shabtis that follow Tut around. They were responsible for helping keep the house clean, but also helped Tut out a lot with homework and other day-to-day chores. I just loved the interactions Tut had with them. It added a nice, humorous touch to the story without ruining to the tone of the book. Overall, Hoover did an amazing job. Tut: The Story of My Immortal Life is an amazing start to a promising series. Hoover shows that it is possible to create a detailed, likeable story in approximately 300 pages. It will be interesting to see where this series is taken, what happens with the characters, and what is in store for Tut. I know I'll be waiting. I've read a lot about mythology lately. Greek, Norse, Egyptian, Chinese, it doesn't matter. As long as the book is about mythology, I'll read it. I'm especially loved middle grade, and young adult books about mythology. I blame the Heroes of Olympus series by Rick Riordan for this. Therefore, I thought I would love Tut: The Story of My Immortal Life. Unfortunately, after reading the book I found myself feeling very underwhelmed. I didn't hate it, but I definitely didn't love it either. There were parts of this book that I did love, such as the snarky sense of humor. I also really enjoyed the shabtis. However, most of this book drove me crazy. There were so many plot holes and inconsistencies. For example, Tut breaks an oath to Horus, for which you would think there would be consequences. In fact, it's strongly implied in the book that there will be consequences. However, nothing happens. The whole situation practically gets ignored. Tut, the main character in the book, drove me crazy. He was incredibly irresponsible, and had no common sense whatsoever. He meets this new girl named Tia. From the beginning, she acts very suspicious. Right away you can tell that she's hiding something, and isn't trustworthy. Despite all of that, Tut tells her some very important secrets, and shows her a secret tomb. I just wanted to reach through the book, shake him, and ask him what the heck he was thinking.Other than a little bit of snarkiness from the shabtis, I didn't like Tut: The Story of My Immortal Life at all. The book was a major letdown. It was disappointing, considering how much I loved P.J. Hoover's other book, Solstice. There is a sequel to Tut: The Story of My Immortal Life, but I don't think I will be picking it up. Even though I didn't enjoy this book, younger readers that are fans of the Percy Jackson series might like this book. We first meet Tut in Ancient Egypt, where he is trying to get away from his evil uncle Horemheb, but as we all know, Tut does not escape. However, he is immortal, and doomed to spend eternity at 14, being constantly in the 8th grade! He and his guardian, Gil, have an apartment in Washington, D.C., where they live with Horus (who stays in the form of a one-eyed cat, but talks) and Tut's shabtis, who keep things clean and take care of Tut. After a trip to see a Tut exhibit, Tut has a project that he has to do with Henry, but weird things are happening. When recharging his scarab heart at an obelisk, the monument explodes, revealing the name of Set, to whom Horemheb was loyal. He's almost killed by asps delivered by a brother of classmate Seth, and new girl Tia is paying a lot of suspicious attention to Tut. Fueled by the need for revenge, Tut seeks out a knife that will kill Horemheb, consulting Isis and letting Henry in on his secret. A plague of beetles and flooding descends on the area, closing Tut's school and making his goal seem more logical. Gil is against violence to Horemheb, but Tut feels that his release must have something to do with the plague. Strengths: Action packed, funny, and steeped in Egyptian mythology, this is a great choice for readers who adore mythology, and there are lots of those. Egypt is covered in our 6th grade curriculum, and there's not as much fiction about it out there as I would like to see. The D.C. setting and use of artifacts is fun, and the shabtis and Horus are amusing as well. Best of all, it came in under 200 pages! I'd been busy but had to get reading done, and had this been yet another 400 page fantasy book, I would have cried. As it was, I looked at the length and thought "Oh, sure. Easy." Think any middle grade readers ever look at books in this way? Food for thought!Weaknesses: This had some inelegant turns of phrase at the beginning and a few plot devices that struck me as odd and made me question the accuracy of the mythology. I don't know that this will bother the target demographic-- as a former Latin teacher I expected Tut to have a more... Egyptian voice. And a different name. This would be open to a sequel (which might help clear up my confusion about Tia's motivations), which wouldn't be bad, but it would be more fun to have other stand alone books about other teen immortals by this author.When I'm working on book orders and it seems like half the books are sequels, it makes me feel less favorable towards series! Citations: Hoover, P.J. (2014). Tut: The story of my immortal life. New York, NY. Starscape BooksGenre: Egyptian Mythology/ Fantasy/ Young adultFormat: Chapter bookReading level: 5Theme/topic: Egyptian MythologyGender: MaleRace/ethnicity: Egyptian Socioeconomic status: wealthy Summary: Tut is a 14 year-old boy from Egypt is has the curse of living an immortal life, which means he can never die. When he escapes Egypt while running away from his evil uncle, Horemeheb, he goes to live in Washington D.C. with his guardian, Gil. Tut lives a pretty good life with a lot of riches and people who will wait on him and give him whatever he wants but his biggest problem is middle school. Since he doesn't age Tut is stuck in middle school forever, which is absolutely awful for him. His evil uncle has escaped from a tomb and in now after Tut again which is when everything gets exciting. This book was a very fun an interesting take on Egyptian mythology. In-class: I would have my class write about if they were a pharaoh and what they would do with all of their gold and riches. The story of Tut's life? Hardly. A more appropriate title might have been, one inch in Tut's immortal life. Because while we see places where Tut's life offered adventure (the Crusades are one of the places), we don't get those. What we get, is a modern Tut; this caters to the YA audience. I think Hoover has such an amazing context that she could pick up from any of these places if she ever wanted to continue Tut's story, or rather give him an adventurous alternative history novel. Overall, I'd say that Hoover's book takes an interesting spin on Egyptian Mythology. It's hard to read a book of this sort with objectivity and without comparing it to Riordan's three mythological series, but I largely was able to do so. I definitely would be interested in seeing where Hoover takes these characters for a potential series. I absolutely love Egyptian Mythology, so I really would love to see this continued!I received this book (Advanced Reader's Copy) for free through Goodreads First Reads. You think middle school is tough? Try being stuck there . . . forever. While also having to deal with crazy relatives, murderous cults, and, you know, homework!Tut: the Story of My Immortal Life is a wonderfully paced, adventurous re-imagining of the life of the world’s most famous boy king. Young people will be immediately drawn in to Tut’s relatable, modern world and thrilled with Hoover’s fantastic interpretations of familiar characters like Gilgamesh, Horus, and Isis (to say nothing of the hilarious shabtis). Tut is the whole package, a perfect balance of fast-moving story with just enough history to delight educators looking for a way to interest their students in ancient Egypt.An absolute must-read for fans of Rick Riordan’s Percy Jackson series and for all lovers of historical-based fantasy. Your young, would-be monarch won’t want to put it down and will be clamoring for a sequel! So, it turns out that King Tut didn’t die back in ancient Egypt. Rather, the god Osiris kept Tut from dying and gave him immortal life. Tut has been stuck as a fourteen-year-old ever since. Unfortunately, the god Set gave Tut’s advisor, Horemheb, eternal life also. For over 2000 years, Tut has wanted revenge on Horemheb for murdering his family. Now his chance may have come if he can only track down a particular knife with special powers. Like any fourteen-year-old, Tut has an unfortunate habit of doing the opposite of what he is told. It seems likely that he would have learned more during his thousands of years alive. It was also tedious that Tut was so stuck on revenge. You will enjoy this if you like adventure, some treasure hunting, and even some humor. Readers may find themselves wishing they had their own shabti, little men made of granite whose only wish is to fulfill every one of Tut’s desires. This was a lot of fun. Tut is an eternal 8th grader due to a beginning I won't spoil. His "big brother" is Gil, short for Gilgamesh. OK, that is a pretty far fetched pairing but it actually made some sense. Tut's goal in life is revenge on the guy who killed his family and him: Horemheb who ruled after him. How Tut manages to carry out his campaign against Horemheb and work on his class assignment about his own burial goods is a hoot. His relationships with his Shabtis and his "cat" Horus is also lots of fun. Don't take this book seriously at all. For starters there is never any mention of Ankhsenamun in this book, which is probably pretty discrete seeing this is meant for tweens and younger teens to read. The story makes sense if you don't try to analyze anything. I hope there is more coming in this series. It seems as though there might be. I'll have to check! After three thousand years stuck as a fourteen year old, Tut has a pretty good life. He's rich, lives with his protector Gil and the god Horus and has his devoted clay shabiti from his tomb to wait on him hand and foot. The worst thing in his life is the fact that Gil has convinced him to endure eighth grade. Again. 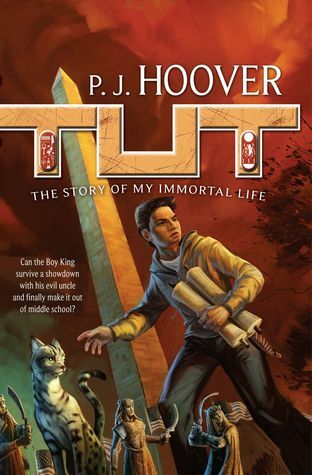 Then, Tut goes to the museum exhibit with the items from his tomb, and things start going downhill fast.A fun run through DC and Egyptian mythology, this book is another great adventure from PJ Hoover. The gods are brought to life in a realistic (and intriguing) way while the mystery and adventure throughout keeps the reader turning the page. I would recommend this for any kid age 9 and up. Fun YA fantasy/historicalish fiction. King Tut was immortalized at the age of 14 and has been living an immortal in hiding sort of life ever since then. In current times, he is in middle school in Washington DC with his cat Horus - yes, the actual god - and his friend and protector, Gilgamesh, who usually goes by Gil. Very little information is given about what Tut and Gil have been doing for the last few thousand years, which makes this story of the eternal 14 year old a bit lacking. Now, he has to fight Horemheb again or be taken down by Set. Along with his friend Henry and a cute girl named Tia, Tut sets out to exact his revenge - which does not work according to plan. It is a cute story for middle school age kids. I know what you are thinking, this is another Rick Riordan modern day demigod type story well guess what. This book has nothing to do with demigods at all, I will say this not only do the gods of Egypt exist but so do other gods from other pantheons walk among us as well. Tut: The Story of my immortal from beginning to end, is a great read if you love mythology especially egyptian mythology you will definitely enjoy this book. Take it from me I read this book in 2 days and I absolutely love books based on mythology, so that should tell you how much I enjoyed reading this book. So please give this book a chance it is worth picking up, I honestly can't wait to read book 2. Fantasy written with slim basis in historical fact of the king's existence. An action mystery with lots of unfolding adventures for King Tut as an eighth grade student with gods and goddesses abounding. The evil uncle, his nemisis, has already killed three members of his family to gain control and is now bent to get him out of the picture. Help comes from the school project and his project partner, Henry. A relative of the evil uncle, Tia also goes to middle school and is helping King Tut or is she? With Washington DC as the base of the action, there are lots of monuments involved in this story. Good for boys in particular. Anything P.J. Hoover writes, I'll read, and this one is fun. (But seriously, being 14 forever? How is that not everyone's worst nightmare?) I love how P.J. can take ancient myths and wrap them in a modern setting--that's what keeps me reading her books. Definitely would recommend this one for my friends' kids to read (and for adults who still enjoy MG & YA fantasy). A fun read as the immortal Tut, living as a teenager in Washington D.C., tries to avenge the death of his family by killing their murderer, General Horemheb. A sure winner for the middle school audience! 6th grade book club book and 2015 Lone Star. I think the kids will like it even more than I did. Looking forward with a Skype visit with the author in March! This is a great recommendation for Rick Riordan book lovers! Lots of action, adventure and of course mythology! Tut is a well rounded character and Horus, the cat god is a hoot! Fun, fun,fun! THIS BOOK IS AMAZING!!! I am hoping that we get a second book. The way the ending was set up adds to that thought. Fun take on an immortal Tut! Humorous dialogue and fast action scenes that take place in the underground of Washington DC! A fast fun adventure perfect for fans of Percy Jackson and Harry Potter. Egyptian mythology, the boy king, adventure...it's perfect for any kid out there. Fans of Rick Riordan will enjoy this series about an immortal King Tut and his adventures... in middle school. This was an amazing book. I really loved it and I would recommend it to all my friends. I loved this book. It tells an amazing story about the immortal King Tut and his battle against his evil uncle and the Cult of Set. I would recommend this book to those 10 and up and love to read. A n imaginative novel that mixes history with fantastic adventure.